Every year, at the occasion of the Khao Phansa festival in Thailand (the Buddhist Lent), anyone can go to meditate in a Pagoda. It can just be to get away from your daily routine, or make good on a vow like to quit smoking. Usually people living in cities would take on that opportunity as a number of pagodas and revered places have basic infrastructures to welcome the devotees. A number of cave systems across the country are also popular and offer a safe refuge from the elements and mundane disturbances. In this case the favored place is a large cave system in Central Thailand named Wat Tham Boya which measure about 120 meter in lengths and at part 20 meter’s high and was discovered 50 years ago. It’s entrance marked by a sacred tree, is halfway up the hill above a pagoda and can be access by a fight of a couple of hundred steps adorned with gilded statues and small shrines. Here, mostly women come to meditate as the facilities are rather good. 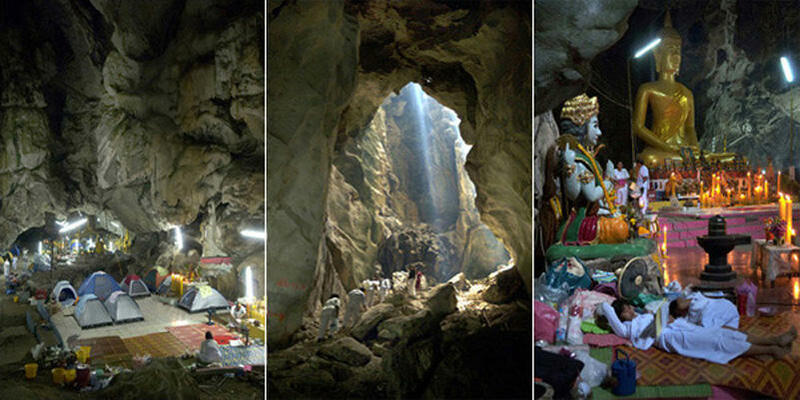 A huge gilded Buddha statue, about ten meters in height sits near the entrance and there are another half dozen small shrines adorned with Indu gods at other corners of the cave. The place has been fitted with tents and it resemble a wild underground camping site. People spend their time praying alone or in group at different small shrines, reading and sleeping. Since one of the main feature of the Khao Phansa festival is the making and setting of big candles at the places of worship, we can see the statues adorned with often more than a meter high candles which have been carried up there for the occasion. The pictures are available at ONASIA. 100 blogs in 100 days, day 34: un Papiers TechBlogDay 34 of 100 blogs in 100 days comes to us from Raghavan Srinivasan Blog: un Papier’s TechBlog About: un Papier’s TechBlog postings are based on the premise that ” people would want to read a stanger’s blog if …This is an interesting blog. good job! When you get time check our Find GOLD with lycos site at http://www.thegoldhunter.net/. With new technology that’s available there are Millions in GOLD just waiting to be discovered. They are even filtering and recovering GOLD out of water! A new GOLD RUSH is coming… be a part of it! Take a break… check our Find GOLD with lycos site out at http://www.thegoldhunter.net/. Is it time for a new hobby… that could actually earn you MONEY?